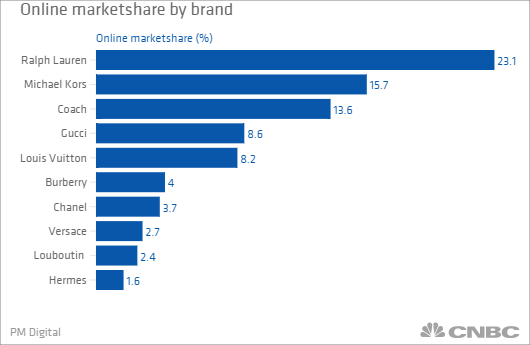 Although luxury brands are slowly making strides in the digital realm, a handful of companies are still far and away leading the pack when it comes to online traffic. A new report by integrated marketing firm PM Digital found that five labels—Ralph Lauren, Michael Kors, Coach, Gucci and Louis Vuitton—accounted for nearly 70 percent of desktop and mobile market share for the category from January through August. The same brands led the index over the same time frame in 2013. PM Digital CEO Chris Paradysz attributed the lack of change to the fact that some high-end brands embraced social media and e-commerce from the get-go; others have been hesitant to tap into the channels for fear of their mass accessibility, and their potential to destroy a brand's "premium price mystique." "Luxury retail has always maintained a highly nuanced relationship with digital media," Paradysz said. "As proven by this study, however, more luxury brands are following and adapting to their customers ' digital and mobile-first mindsets." It's important to note that these results don't always translate into strong sales. Coach, for example, has seen its shares fall nearly 40 percent this year, as it struggles to revamp its product under new creative director Stuart Vevers. Prada shares have also tumbled this year on slumping sales. Among the survey's other findings, handbags, belts, shoes and other accessories are driving the most search clicks for luxury brands. Also, mobile now accounts for the majority of traffic to luxury sites, at 59 percent—an extension of the growth that's been seen industrywide for retailers this year. PM Digital's study examined 73 brands in the luxury apparel and leather goods sectors. See below for a list of the top 10 luxury labels' market share.